The new walking path leads into the woods north of the Albany Heights subdivision. 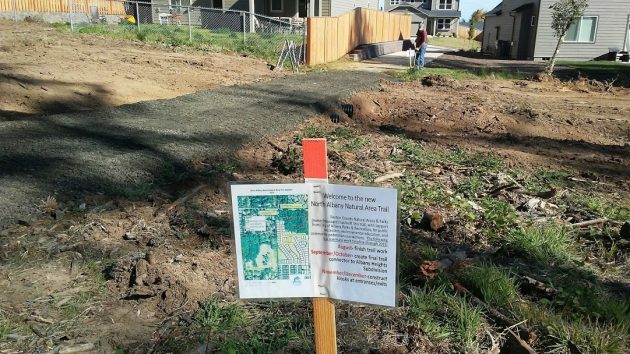 Benton County is nearly finished building a new trail through about 10 acres of woodlands at the southwest corner of Valley View Drive and Crocker Lane in North Albany. The wooded acreage northeast of North Albany County Park was donated to Benton County by the developer of the Albany Heights Subdivision, off Crocker. Park visitors can reach the woodlands by hiking a short distance up a steep street past new houses. 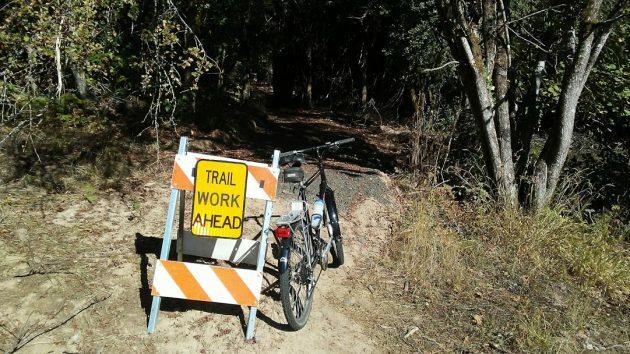 The county has laid down crushed rock to mark the trail, which is hilly and not long — a few hundred yards, I guessed as I pushed the bike along the circular route on Thursday. There’s an entrance off Crocker near Valley View, as well as on the other side. Residents of all the housing surrounding the natural area may be find it a convenient spot to walk their dogs. 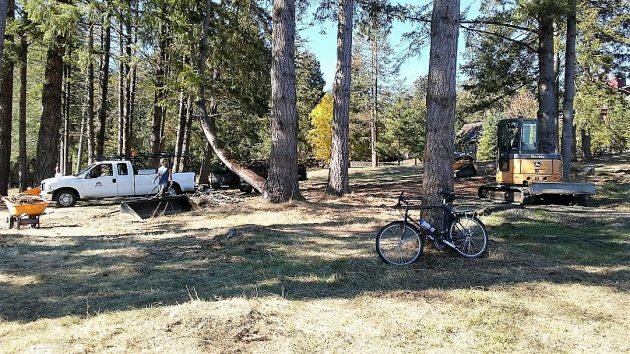 County Park Superintendent Adam Stebbins put out an email notice inviting neighbors to get together for “a day of community caring” from 9 to 1 on Saturday, Oct. 27, at the park. Those who come can talk with parks representatives and help plant and also clean the park and new trail. Refreshments will be provided at noon, according to the notice. Development of the trail in the donated woodland was part of a county project to improve the 22-acre North Albany Park. The biggest move so was the removal of about 200 dead and dying Douglas firs and other trees in 2016. 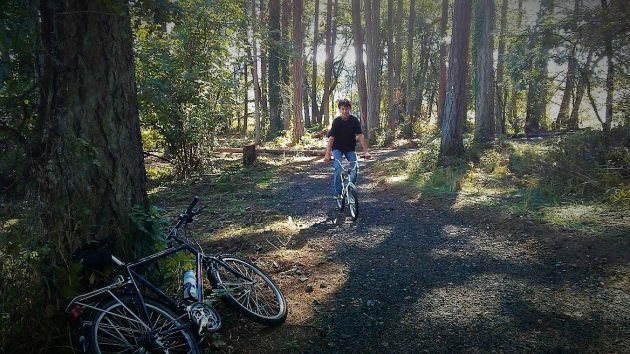 A boy on his bike tries out the woodland trail on Thursday. The connection between the county park and the Albany Heights subdivision. A county crew at work in North Albany Park on Thursday. Thank god for Benton County. Their leadership is something Linn County commissioners would do well to study. Nice to see the construction unfolding! This was not just a Benton County “leadership” endeavor .. it was the joint collaboration/effort by the Developer of Albany Heights, City of Albany and Benton County. N Albany Park was/is owned by Benton County, thus the land donated for the Park expansion needed to be to Benton County, but without huge involvement from said three entities this would not have happened.